Optimizing your blog is tough. Where do you even begin? But why? Because measurement provides insight. And with insight, you can make strategic decisions to improve performance. And in this post, I’ll cover eleven blog metrics you can use to improve performance. Let’s dive in. Want to take your company’s blog to the next level? 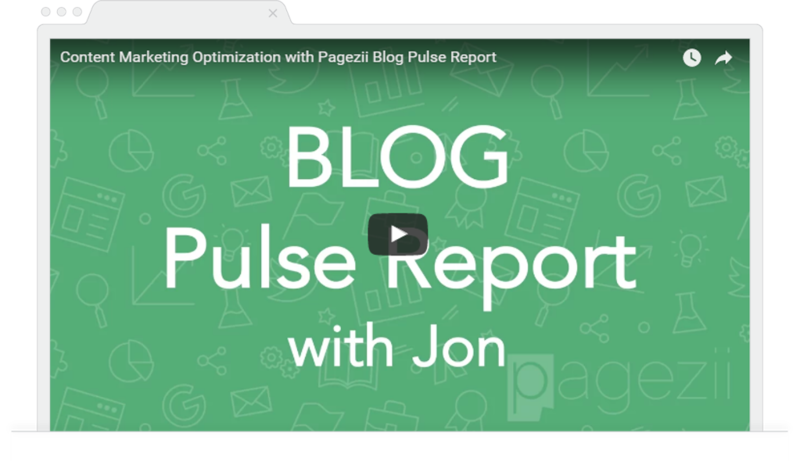 Learn how to analyze and optimize your blog with our blog pulse report tutorial now. We use blog metrics because they gauge our blog’s health. When we understand blog health, we understand what we’re doing right and where to improve. Let’s dive a bit deeper into these blog metrics. Making your blog visible in search engines drives visitors to your site. And because searchers are actively seeking topics you discusses, these visitors are high-quality. Metric Definition: SEO score is the average SEO score across your blog. This metrics looks at how well you’re optimizing blogs posts from an on-page SEO perspective. SEO scores in the +80 percent range have better chances of ranking high in search engines. 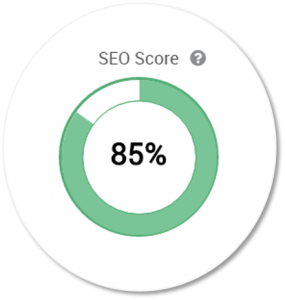 Scores in the 79 – 55 percent range are optimized but could use improvement to increase organic ranks. Anything lower than 55 percent needs optimizing. Using Blog Metrics to Improve Performance: Use your SEO score to hone in on blog posts that aren’t fully optimized. Then apply on-page SEO best practices for improving organic traffic. Certain styles of communication resonate better with audiences. So don’t you want to write for your audience’s preferences? This is when Reader Profile Metrics come into play. 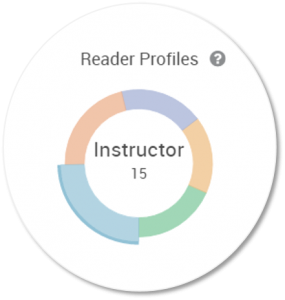 Metric Definition: Reader Profiles analyze word length, sentence structure and grammar usage of each post. Metrics enter the game when you find the average shares per post for each reader profile. Using Blog Metrics to Improve Performance: Look to see which Reader Profile gives you highest social shares on average. This is a good indicator that specific writing styles resonate with readers. You can then style future blog posts in a similar format. If you want potential clients to see your blog, you’re going to have to promote it. And social networks are the place to do it. Because they offer large audiences you can segment. This is why you need to analyze social share metrics. 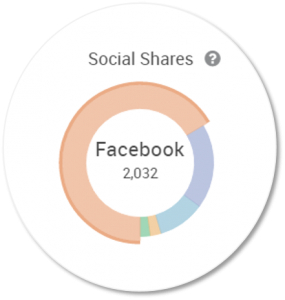 Metric Definition: Total social shares platforms that your blog posts get engagement on. You can also look at social platform metrics to show you the average share per post for each platform. Using Blog Metrics to Improve Performance: You don’t want to make wild guesses when it comes to sharing blog posts. Use metrics to inform your promotion strategy. If you see a certain platform get’s traction over others, target that. The key to unlocking this data is to look at your competitors too. Want to know how many times people are viewing your blog posts? Then Total Views is what you’re after. You can think of views like blog popularity. This blog metric shed light on how many eyeballs have seen your content. Metric Definition: Total views calculates the number of page views your blog is receiving. This is a catch-all metric, combining new and returning visitor page views. Using Blog Metrics to Improve Performance: Use Total Views to understand blog growth. This metric comes into play once you’ve started optimizing your blog strategy. You want to see this metric grow in size when determining performance. When you’re building a company blog, one of your goals is to build relationships. This is when visitors turn into subscribers, also known as readership. Metric Definition: Readership looks at the number of returning visitors to your blog. When you look at this metric alongside total views data, you’ll understand how many new visitors come back to your content. Using Blog Metrics to Improve Performance: As you track your blog, gauge readership growth. Here’s how: Look at Total Views Growth. Divide that number by your readership each week. This is going to show if your readership is growing with your blog popularity. Ah, bounce rates. One of the blog metrics we all know. But what isn’t so clear is how to use this metric. Keep reading to learn how. Metric Definition: Bounce Rate is the percentage of single-page visits to your blog. A visitor is added to the “bounce” list when they land on your blog post and leave with moving on to other pages. It’s an awesome metric for understanding engagement. Using Blog Metrics to Improve Performance: Now you know the percentage of visitors landing on your blog and leaving with no action. But how do you lower this metric? The key here is to increase engagement. Do this by including relevant calls-to-action on your blog. List related post that builds on the original topic. You can also provide links to other pages on your site. This metric doesn’t get the attention it deserves. But it’s important because it tells you how your readers consume your content. Metric Definition: Device Views breaks down which screens you audience reads on. There are three screen sizes: desktop (large), tablet (medium), and mobile (small). Using Blog Metrics to Improve Performance: Write content ideal for your reader’s screen size. If you get a lot of mobile traffic to your blog, odds are visitors are searching for you on the go. So try writing dense content that gets’s to the point fast. On the other hand, if your readers are mainly using desktop to consume blog posts, go ahead and write long-form content. If you’re after engagement metrics, time spent on your blog is a great indicator. Higher time spent means higher engagement. Metric Definition: Time Spent measures the average time a visitor spends reading your blog. It indicates if users take the time to digest your content. Using Blog Metrics to Improve Performance: Different blogs require certain time to consume. Improve your blog performance by taking into account blog post length and time spent. Here’s an example: You write long-form posts that should take four to five minutes to read. But when you look at time spent data, you see readers really only spend one minute on your blog. This could mean they prefer dense content. And because of this, you should shorten post length. For our final blog engagement metric, we’re looking at Read Posts per Visit. Because you’re building up your blog, you want visitors to check out multiple posts. This is going to show you’re a leader in the industry. Metric Definition: Read Posts indicates how many posts visitors consume per visit. Using Blog Metrics to Improve Performance: Look at Read Posts per visit when you’re analyzing blog engagement over time. As your content quality improves, you’ll see this average read posts improve. You can also improve this metric by building multiple blogs around popular topics. This will glue readers to your content. This is no secret to anyone – your readers are interested in trending topics. This is because they’re browsing industry blogs to keep their tools sharp. So make sure your blog is discussing what’s in your industry with trend focus. Metric Definition: Trend Focus shows if blog content aligns with current industry trends. The higher the percentage, the more aligned your content is. Using Blog Metrics to Improve Performance: Trend focus is all about writing blogs which audiences want to read. So to find this out, you have to look at what your topics your industry is talking about. This means direct and indirect competitors and industry publications. 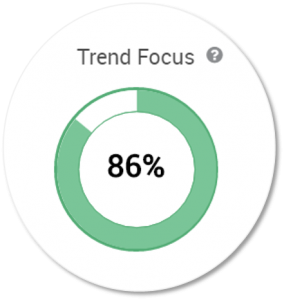 Aim for a trend focus score of 90 percent. This means you touch on popular topics, but leave room for unique content. How often should you publish blogs? There’s no simple answer. Because there are so many factors that play a role. But one way to find out is to look at industry post frequency. Metrics Definition: Post frequency is your average blog posts published per week. Using Blog Metrics to Improve Performance: Analyze how often other industry players are posting. This leads to two routes you can take. The first is beating your industry at their own game. If you notice industry players are posting often, post more frequently with relevant topics. You can also take opposite approach. Because your industry has a certain post pattern, break the mold and offer a fresh taste. This is how to use blog metrics to improve performance. 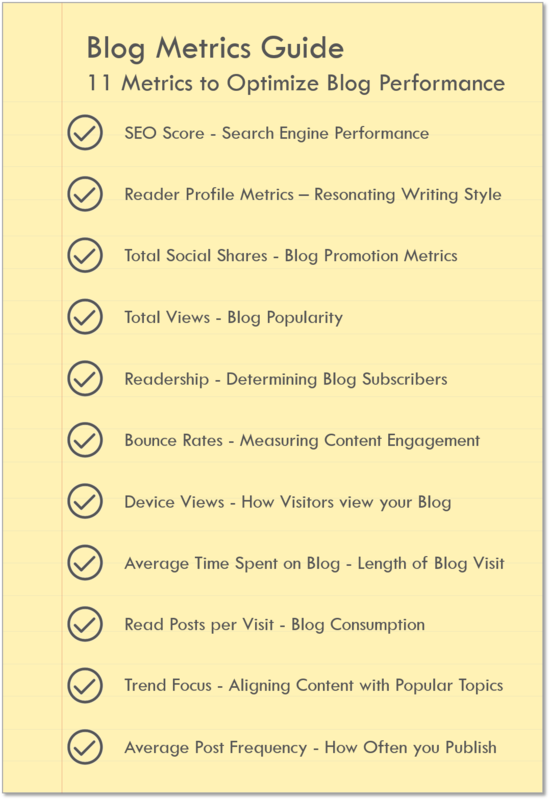 Would you include any other blog metrics to the list? Leave your comments below and we’ll update our post with your suggestions.